Summer is full of fun…and planning for next school year! As we begin First Grade next year, we’ll be reviewing CVCs. 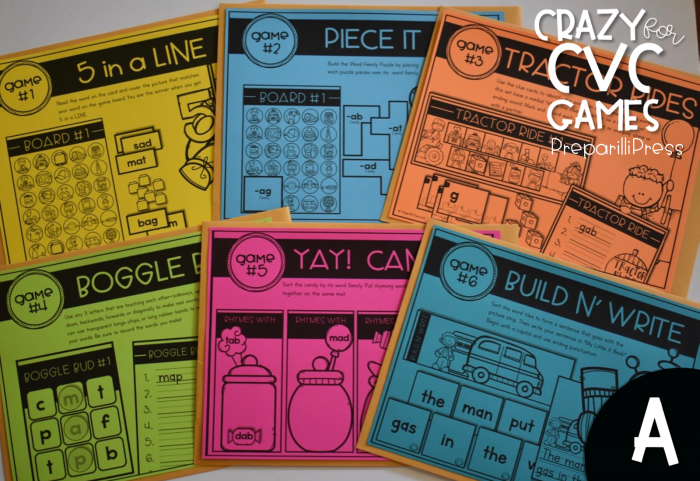 Instead of using lots of great worksheets, we are going to start our year with CRAZY for CVC GAMES! The best part about these CVC games is that the are ALL in black and white. No expensive colored ink needed here! 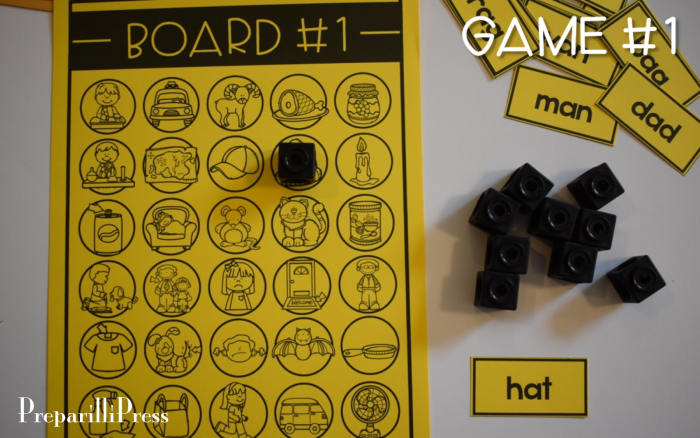 So, grab your favorite Astrobright cardstock, and start printing up some learning fun! 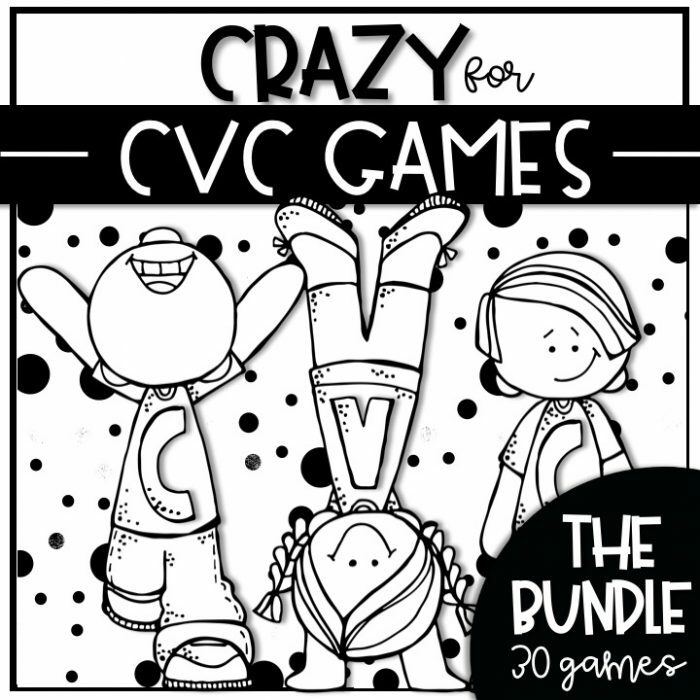 THE BUNDLE will contain 30 games–six games for each CVC vowel group. 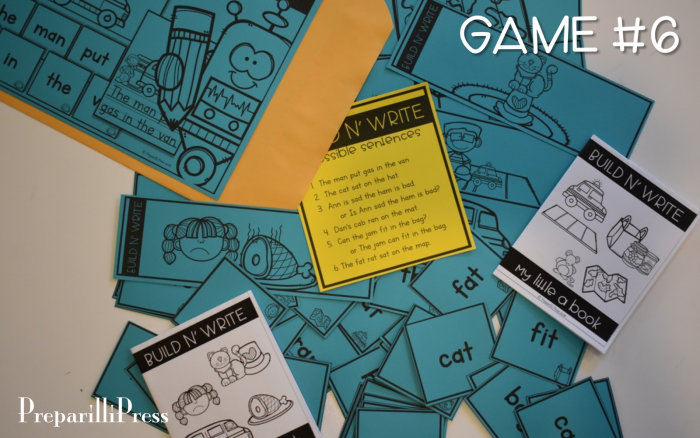 These games can be used during the KINDERGARTEN school year in small reading groups, morning work tubs, for fast finishers, literacy stations, etc. 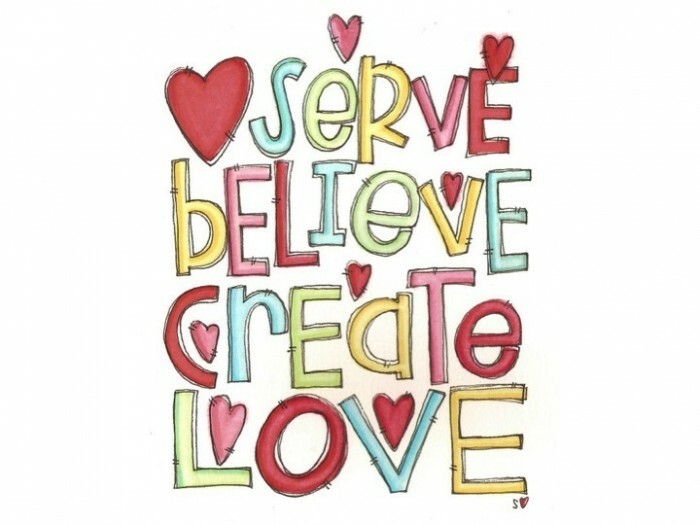 Whatever works best in your class! 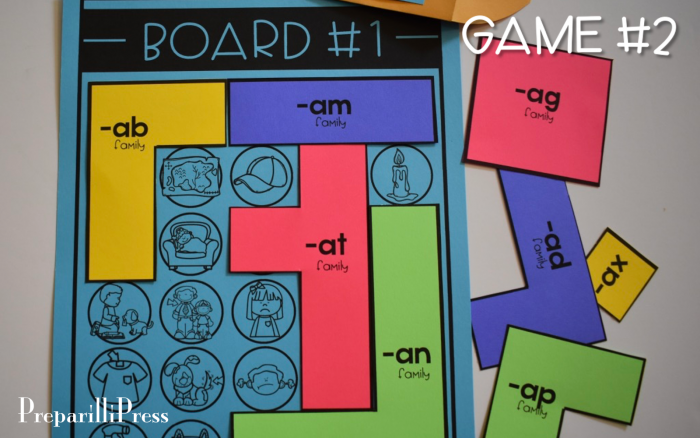 In GAME #1, playing with a partner, or alone, your students will read CVC words and mark their pictures on the game board. We like using Mathlink Cubes for this activity, but you could use whatever game pieces you have on hand. When they have found five words in a line, they win! Or, they could be like my kids, and keep reading and marking words until the whole board is full of math cubes! GAME #2 is a word family Tetris puzzle. It is a great tool for assessing your student’s word family knowledge and critical thinking! 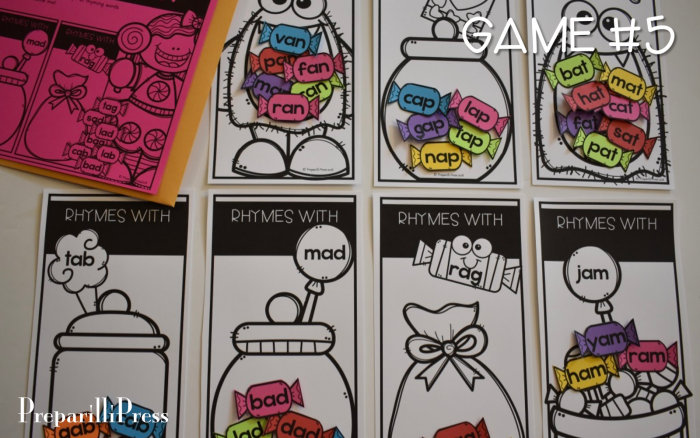 Using the game board from GAME #1, your students will cover the words that rhyme (that are in each word family)with the correct word family puzzle piece. 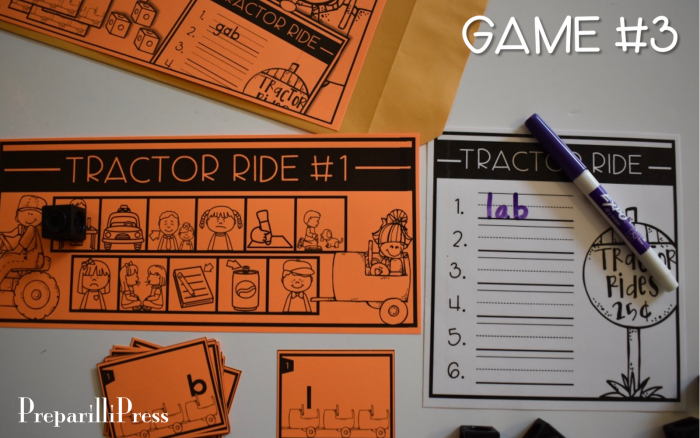 GAME #3 has four different TRACTOR RIDE game boards (#1: -ab & -ad; #2: -ag & -ax; #3: -am & -ap; #4: -an & -at). 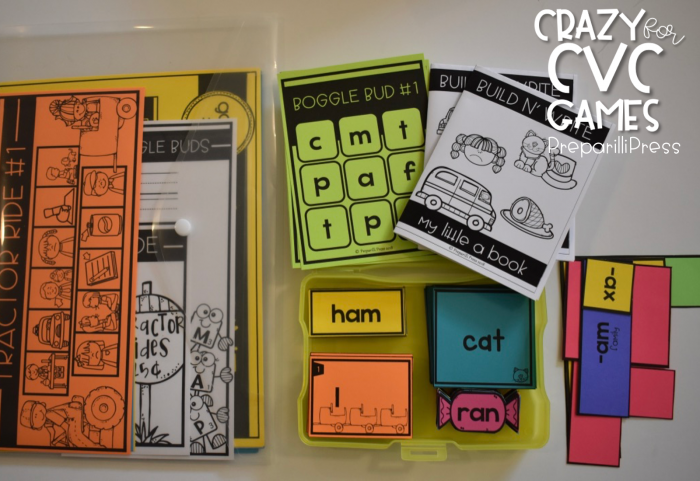 Your students will find and build the medial A CVC words on each board by drawing clue cards. Each clue card will give them a beginning or ending letter that they will use to find the word. This game can be played with a partner, or alone. 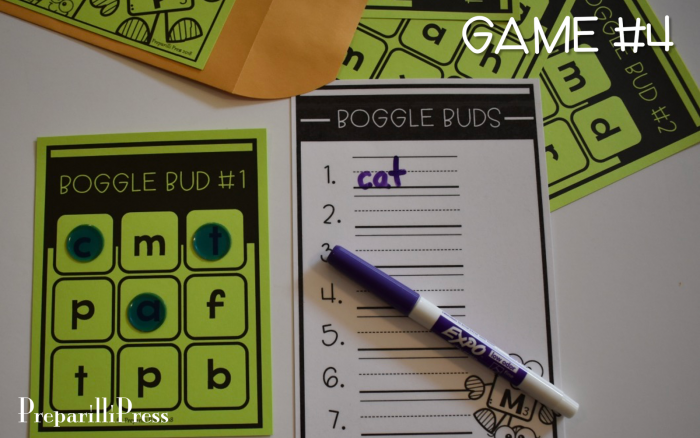 GAME #4, BOGGLE BUDS is a fun way for your students to practice their beginning reading skills. 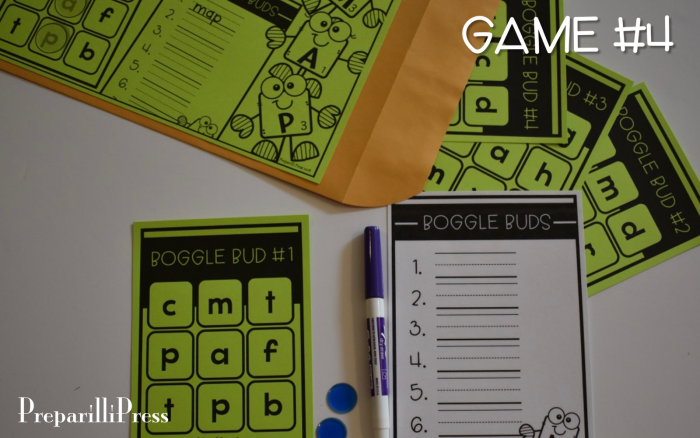 This short A pack has four different Boggle Bud boards (try saying that 5 times fast :). Students will search for CVC words using three letters (including the medial A) that are touching each other in any way–sideways, up and down, or diagonally. 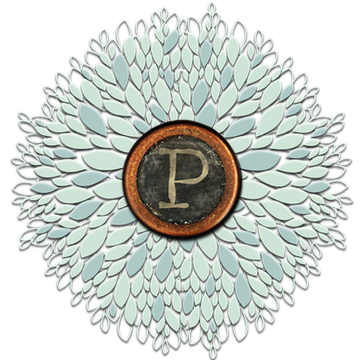 The words can also be formed forward or backward. GAME #5 is sure to be a class favorite. Who doesn’t love candy?!? It is really a fun way to practice reading and rhyming words. 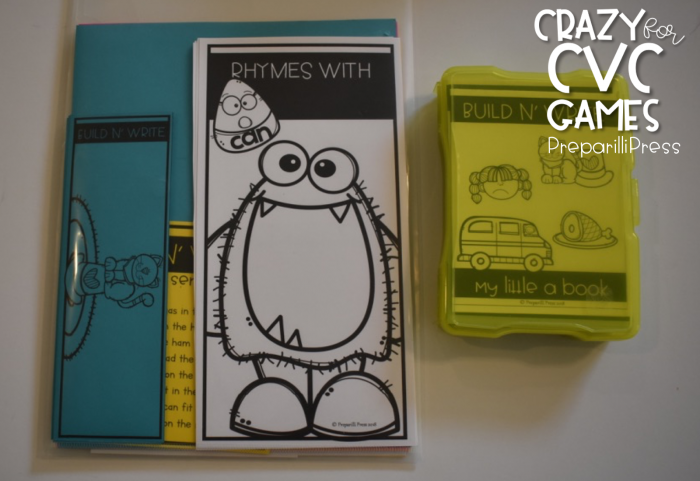 I printed the rhyming boards on white and the candy on all different colors of cardstock. 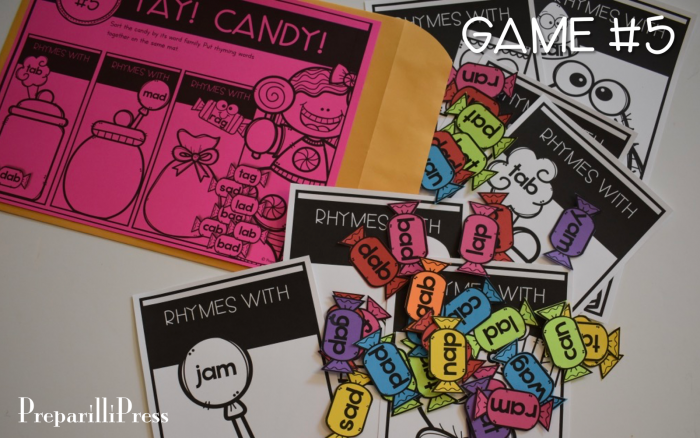 But you could print all the candy on one color (that matches the title page) or, if you’d like to use this activity to introduce the word families, you could print each word family’s candy in one color (a different color for each word family). Your students could then spend less time discerning the word families and more time simply reading the words. 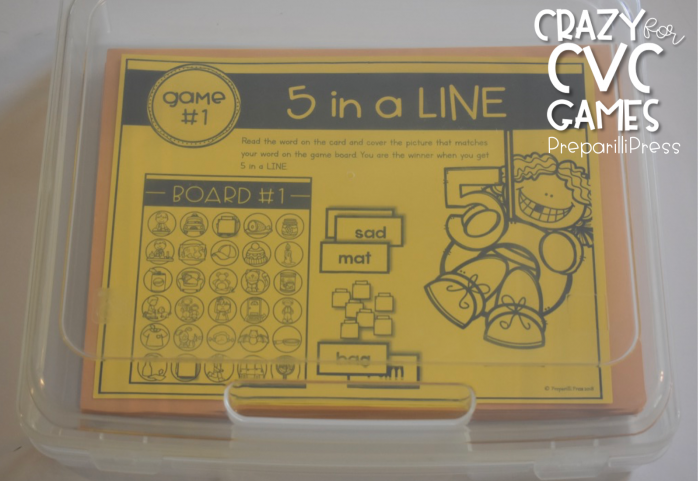 In Game #6 your students will put all of their reading skills together by building sentences with CVC words. There are 6 different picture strips in this game. Each picture strip has a set of word cards (distinguishable by the matching picture on the word cards) associated with it. Only names are capitalized on these word cards. 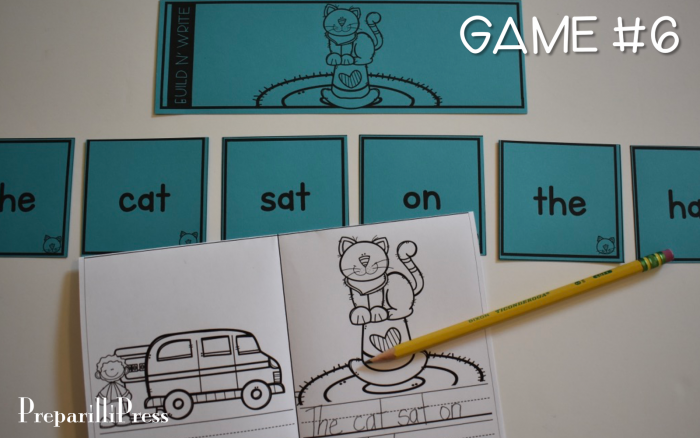 Your students will read each word card and then order, and re-order them until they come up with a sentence that matches the picture strip. Next, they’ll write the sentence into their “My Little A Book” using a capital letter to begin their sentence and appropriate ending punctuation. The only sight words included in this set of sentence building cards are “is” and “the”. Your students should be very successful completing these sentences independently. As a mom of 8, I need to be organized, or not much gets done :). 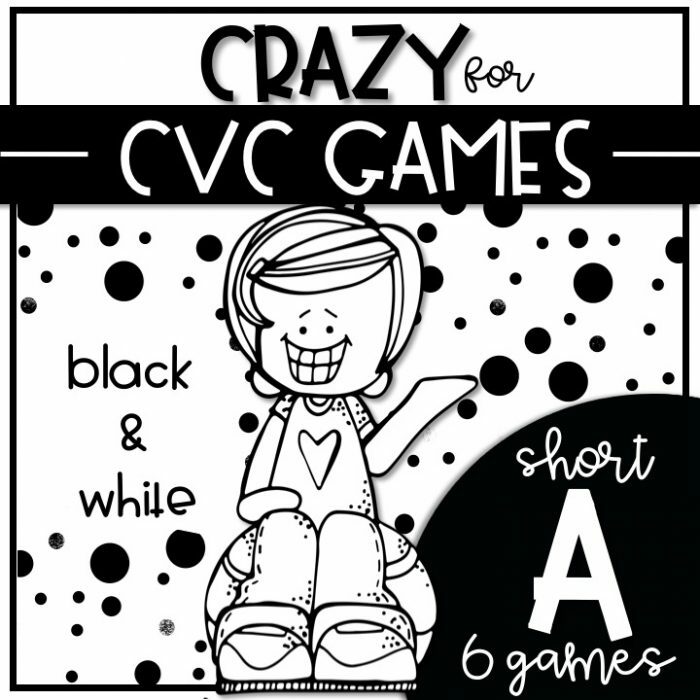 So I want to share with you a couple of ideas on how you can organize the CRAZY for CVC GAMES. The first is super simple and fairly inexpensive. 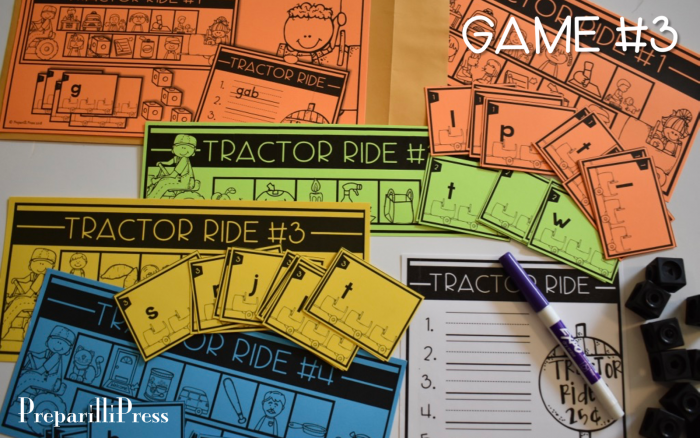 Print the title pages for each game on a different color of cardstock. 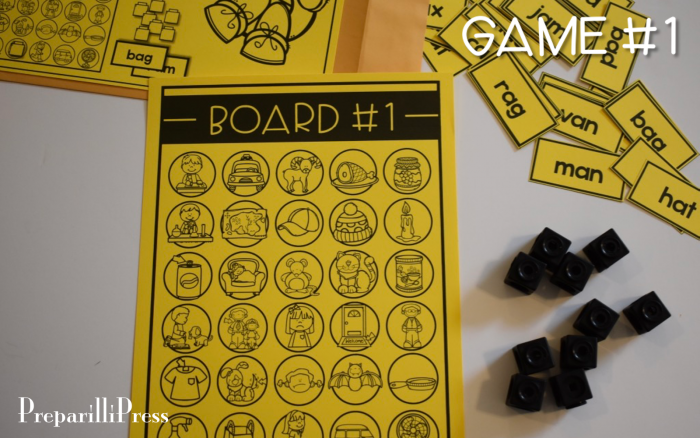 Paste them onto large manila envelopes and tuck all of the game pieces inside their envelopes. If you are into IRIS containers (who doesn’t love them?! )–all of the game envelopes can be stored in one of their 11 x 13 project containers. Another idea is to store all of the game pieces in a 4×6 IRIS container and the larger title pages and game boards in a plastic envelope (I love these by the way! They can handle daily use a lot better than their manila cousins). Everything fits in, nice and tidy :). 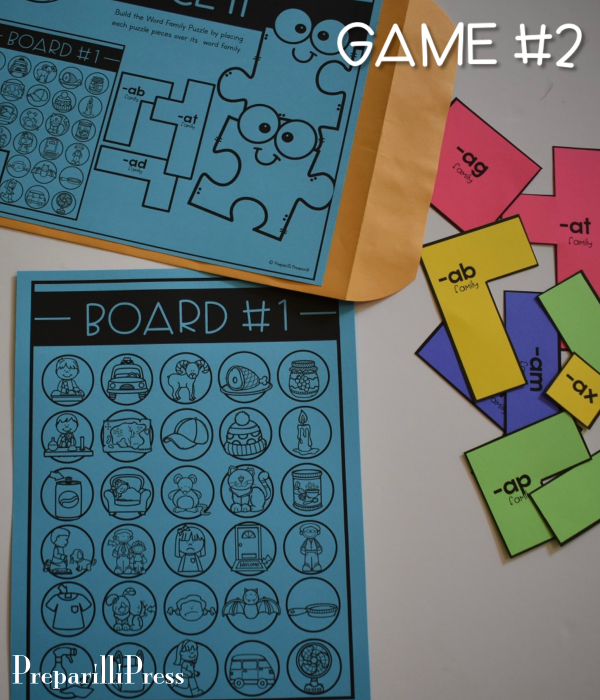 So…6 simple games…low prep…lots of fun…and perfect for teaching/reinforcing CVCs with a medial A! You can grab the short A set on sale through tomorrow. Or grab the whole bundle today! The bundle price will go up as I add each letter’s games.